Alterego | id created, Inc.
Alterego is a socially designed modular seating system that features multiple components. To specify use the individual components within the collection to assemble your own unique layout. Components include planter elements in powder coated steel or corten steel (FG, FP, and FS). 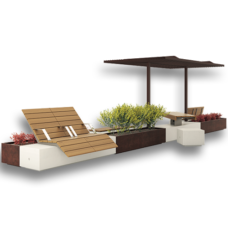 Seating elements available in powder coated steel, corten steel (4VC) and High Performance Concrete (1D and 4V), choose granite or white marble, with polished top and VELLUTO sides. Standard Anti-Deterioration treatment on concrete components. Specify standard color or provide 4-digit RAL for powder coated steel components. Freestanding. Accessories for concrete: hardwood or FSC larch wood seats (backless SP, with backrest SS; choose 750mm or 1750mm), table (TA), chaise lounger (DE), an arbor in powder coated steel with or without stainless steel cables (OM, must be fixed to 4V) and the optional glass panel (PP, must be fixed to 4V with OM). Add options: Anti-Grafitti treatment for concrete and powder coated steel, zinc rich TRIPLEX primer for powder coated steel. Anti-Washout treatment for available for corten steel. Post-production lighting upon request.